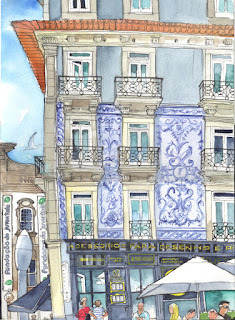 [By Róisín Curé in Porto] It's over, after so many months of anticipation. From getting the news on my 50th birthday that my workshop proposal had been accepted to hanging out with two of the kindest and funniest people ever and meeting all of my wildly enthusiastic fellow urban sketchers, the USk symposium in Porto was the biggest buzz I've had in many's the trip away. I arrived four days early to make the most of my time away. So I had plenty of time to get the most out of this beautiful city. I arrived, hot and bothered, the Friday before the symposium. There was a note waiting for me in my hotel. "Meet us in the lobby in half an hour," it said. It was from Dougie and his good friend Mary. They're the two very kind and very funny urban sketchers I mentioned: Dougie is a Scot and Mary is from North Carolina. 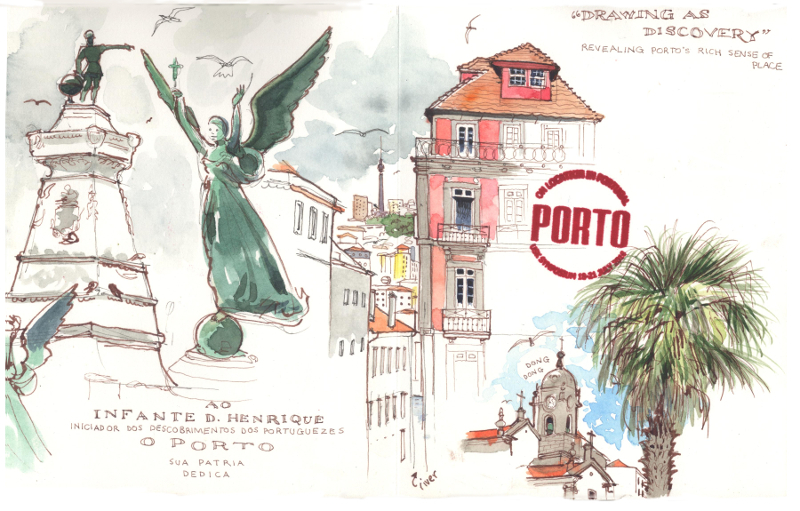 We proceeded to spend the next four days sketching together, eating wonderful fish and salads and generally having a lovely time in Porto, the calm before the storm. "Enjoy this calm time," said Suhita, a veteran of many a symposium. "You will wake up on Sunday and it will be over, in what will seem like a flash." Good advice indeed. 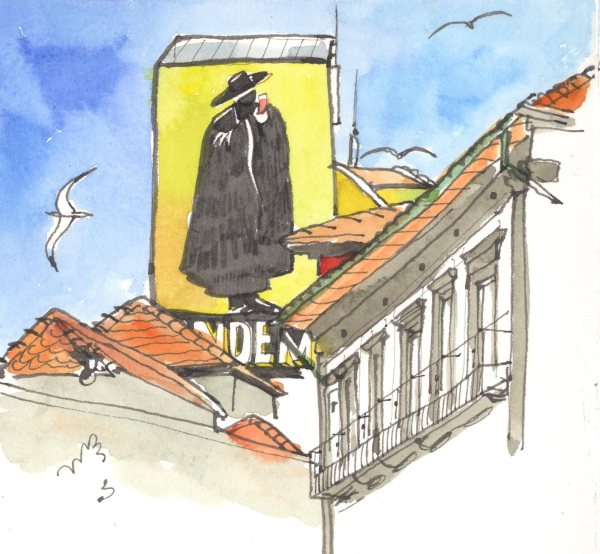 This was my first sketch, done just opposite the Alfándega, the hub of the symposium. We loved those chairs hanging on the wall and the long shadows they threw. That evening, dissatisfied with my earlier sketch, I had a strong urge to sketch some more. 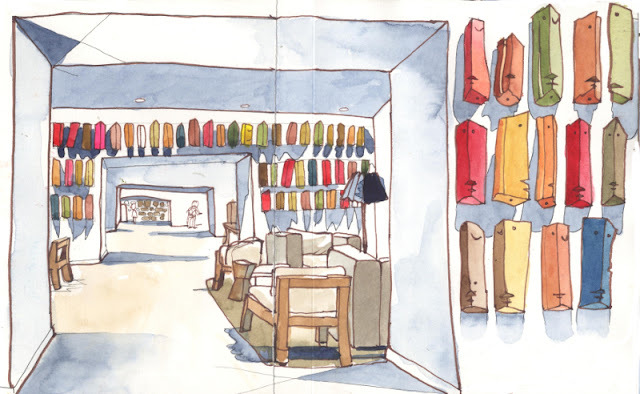 So I sketched the very odd but strangely beautiful wooden sculpture things on the wall of our hotel. I had to fit both top and bottom of the square archway on my page, which made it a bit too wide - in my drawing it reminds me of a creepy Seventies hotel like the one on the Shining - I hope you're not reading this just before bedtime. Next morning Dougie, Mary and I tottled off to this hilltop church, the name of which I keep forgetting. It's up the hill from Sâo Bento and not too far from Clérigos. I meant to fit it all onto the page but failed. At least I got the bits I liked in, which is one of the number one lessons, really. The yellow and white striped flags suggested to us that a pope had planned a visit, or had been recently. The bells struck a deep and booming twelve midday, and so I added sound effects to the sketch. 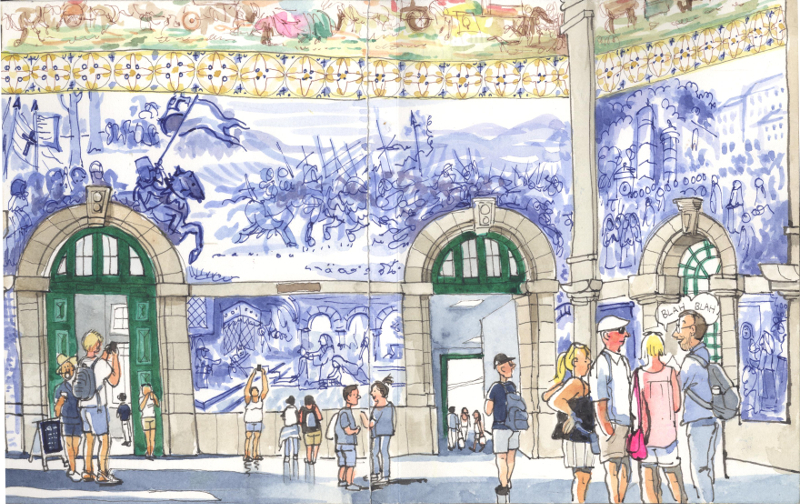 Dougie, Mary and I popped into the café at Sâo Bento train station for lunch - delicious quiche and paninis - and afterwards gazed at those beautiful tiles on the wall, which told the story of Portugal, from a distinctly militaristic point of view. Mary commented that the tiles would be overwhelming to sketch, so I decided to put into practice the technique I would be teaching during my workshop, to simplify that kind of crazy detail. In the end I was sitting there for almost two hours, but it was very pleasantly spent, out of the sun but nice and warm, watching both harried and less-stressed passengers go by. Many were there just to take pictures of the walls, and like the group on the right, to hear the story of them from a guide. Dougie suggested that the woman just left of the centre looks as if she was trying to do a slam dunk into a basket on the wall behind her. Hmmm. It's not a basketball net, but a royal canopy thing, Dougie, for your information. Later that evening Mary, Dougie and I returned to a restaurant of which we had grown fond. 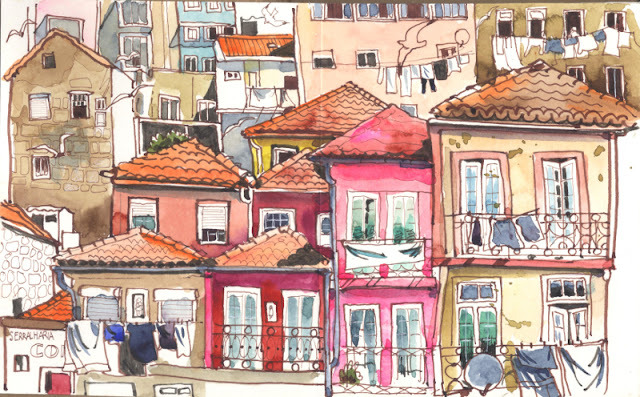 I turned around to sketch the view from the terrace, and I loved the warm red and yellow of the buildings nearby. I used brown ink which was perfect for this sketch. All three of us chose the seafood linguine with squid ink and parmesan and even now, writing those words, I am reminded in a dreamy way of their deliciousness. 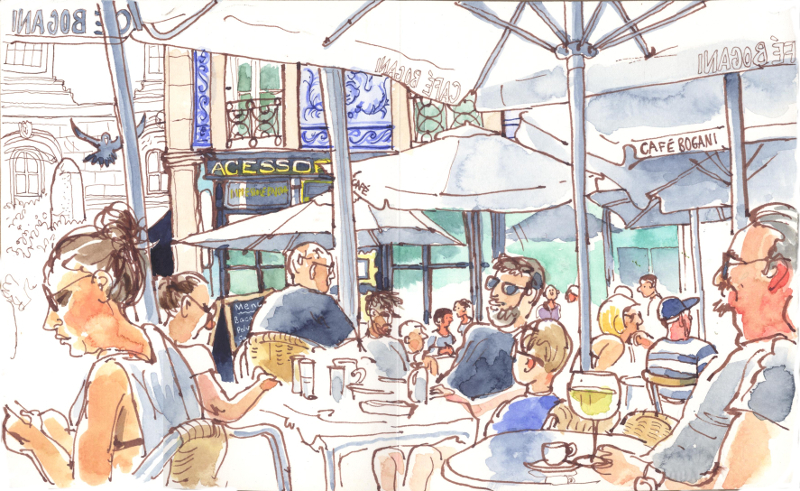 I needed to become familiar with the spot I'd chosen for my workshop location, and so on Monday I sat at a café at Largo de São Domingos and sketched what I saw. A day later, I watched as a little boy of about three took a wet wipe and carefully rubbed off the writing on the blackboard. His mother (why do I blame her? Does he not have a father too?) was not in attendance and his big brother soon joined him in "cleaning" the blackboard. 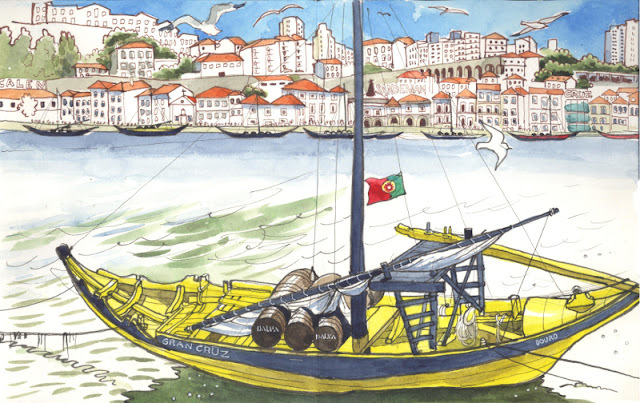 Later that day my friends and I parted company for a while and I found this beautiful yellow boat to draw. The buildings in the background aren't directly opposite the boat, but further along the bank. "Revealed!" said my husband when I told him. "Róisín moves the bank 50 metres down the river!" A heck of a lot more than 50 metres and I still feel uncomfortable about it. Ridiculous - I need to forget that I'm not a camera. 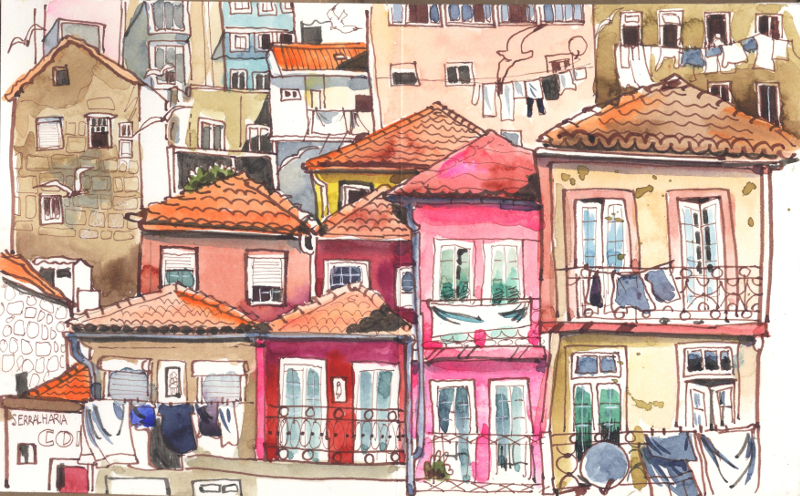 Just as I finished the sketch one of the symposium correspondents, Paulo Mendes, came and offered his help in scouting for a good workshop location. 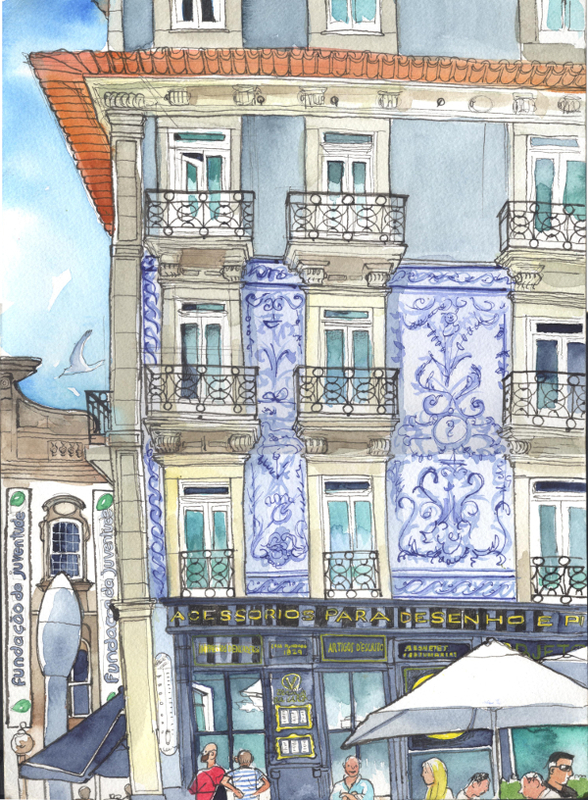 The one I'd been assigned was missing a couple of things I wanted: my theme was to sketch vignettes of the streetscape: signs, cameos, fun things that attracted the sketcher, and to simplify complicated detail, as can be seen all over Porto in the azulejos. I left my yellow banana boat and traipsed up the hill after Paulo. His help turned out to be invaluable - as soon as I saw Largo de São Domingos I knew I'd found my spot. The next day was Tuesday, the first day of the symposium for me, in that I would have a chance to greet my fellow instructors for the very first time. 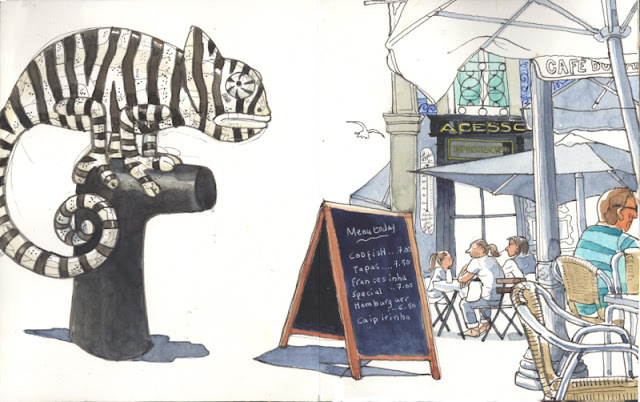 That was pretty special and I was very happy to be able to thank Gabi Campanario in person for having done what he did with urban sketching, and changing my life. I had said it already in an email and I know he's heard it a million times but I wanted to say it in person, because no one but my husband knows how frustrated I was as an artist before urban sketching came along, and even he got bored of hearing about it after a while (well, especially him, actually). Thanks...again. The first faculty tour was to the port factory of Poças on the south side of the river. We were treated to the story of Poças port wine, and a snifter of ruby, white and tawny port. I loved the white and the tawny but am not quite sophisticated enough for the red. (I did not know this was the reason until I was in the airport on my way home and the sommelier chap in the "duty free" area who lets you taste port you might like to purchase made a very smirky face when I said I'd enjoyed the white. 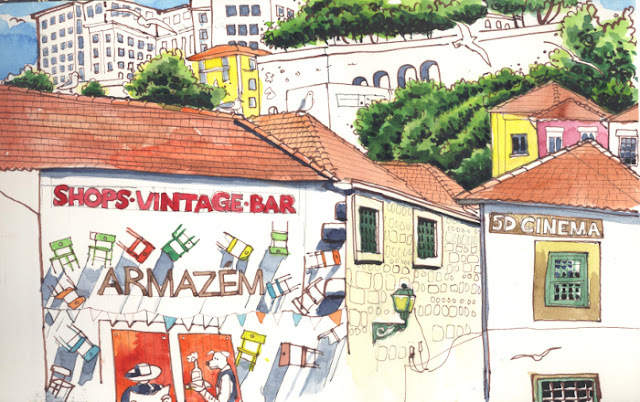 "No one in Portugal drinks white port," he said. "It's only used for summer drinks as a mixer." We listened to the story of the Poças family business, I managed to get two of the three port samples sketched, and then we went below ground into a dark, dank area lined with hundreds of beautiful barrels of port at different stages of maturing. 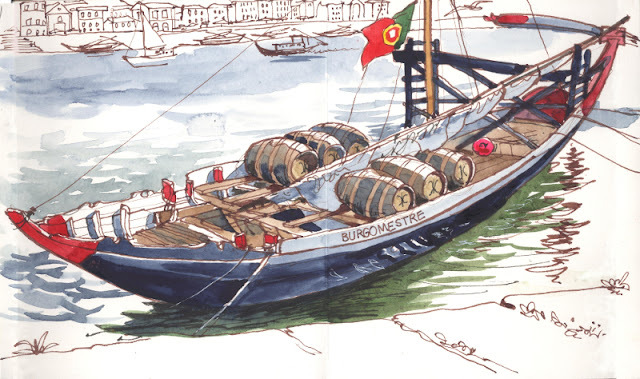 "We recycle the barrels," said the guide, one of the Poças family. "If a barrel breaks, we use a part of an old barrel to fix it. Only time can create that special patina, built up over years, and we are certainly not going to let it go to waste." We were spoilt for choice: everywhere we looked there was a gloomy avenue of barrels receding into spooky corridors, stacked like playing cards. They were so pretty, the hoops at the edge casting elliptical shadows onto the top surfaces, white lettering standing out in the dark. 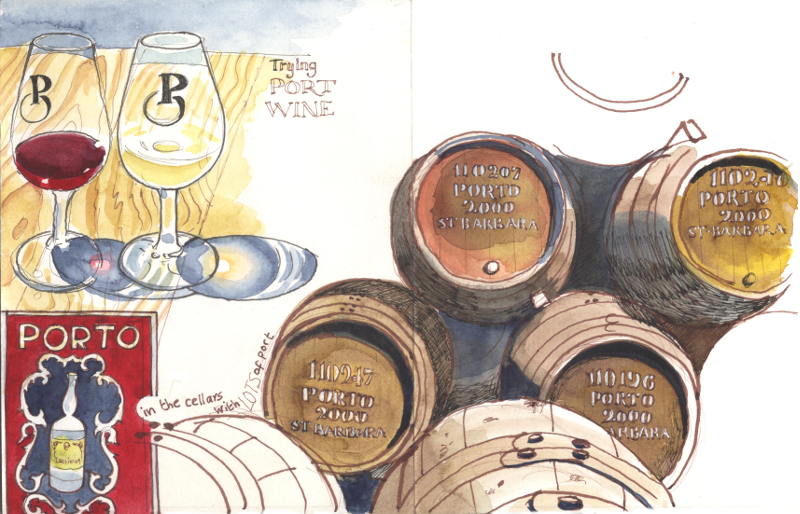 I sat opposite a likely stack, sandwiched in a gap between two rows of barrels. It was so dark that I could barely see, so it was quite a challenge. That evening, the second faculty tour to place. It was a hike up the hill to the Libreria Lello, a beautiful and quaint bookshop which is said to have been a model for one in the Harry Potter movies. Very Gothic. The shop was closed, the USk faculty had the place all to themselves, but I was very hot when I arrived - having missed the convivial walk together up the hill to the bookshop - and somehow I could engage with neither the beautiful, twisting staircase, the ornate lamps, nor even the sketchers everywhere. I think I have inherited my father's contrary nature, which is an uncomfortable realisation: knowing I was supposed to be sketching something made me want to sketch something else. I was at a loss. Then I saw some wrapping paper, with a strange legend beside it. "Wrapping paper for lonely or heartsick people," it said, or words to that effect: the picture was of two people intertwined, the words "hug me" written on it in various languages. I thought of all the lonely people or those in love, and I was moved to draw it, or more precisely a postcard bearing the same image which I saw downstairs. 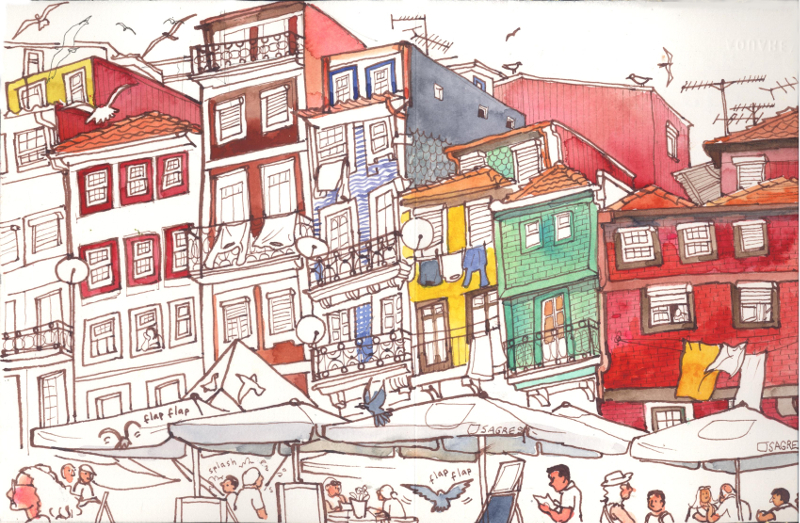 Next day there was a big sketch crawl and I found myself sitting in the Praça de Ribeira beside João, a Portuguese guy making a really stunning sketch using just a fineliner, without colour. 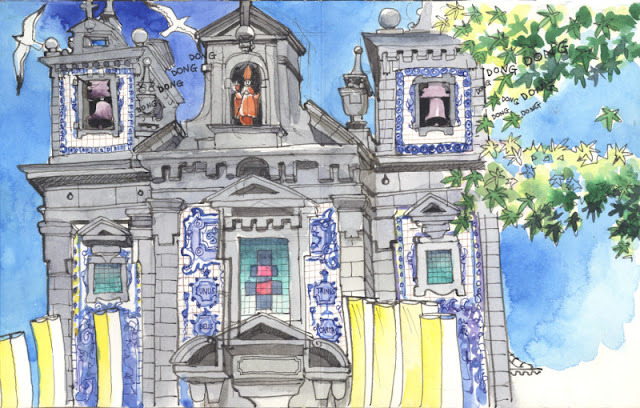 I noticed with interest that it was predominantly men who stopped to admire João's complex and detailed sketch, and while I'd like to say more women stopped to admire mine, the truth is not many people did at all. Luckily that wasn't why I was doing it, although I do love when people stop to chat. 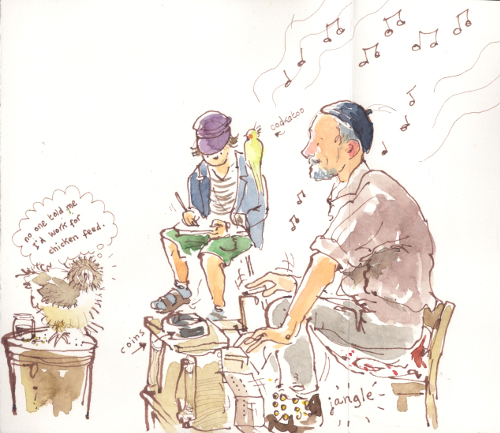 But my luck was in: two beautiful children sat and watched João sketch, and when he went, they turned their attention to me. The older was twelve and despite her long, lustrous hair, I mistook her for a boy - it was her manner, I can't exactly say why. Her companion was a young boy of eight. The girl spoke perfect English. I asked her how come, and she calmly explained that she watched a lot of cartoons. Her friend asked lots of questions which the girl translated for me. They were charming, both of them, and I loved their sweet, innocent presence. They gave me their full attention for the guts of an hour. Suddenly the boy leapt up, his eyes wide. He said something to the girl, and she said to me, "My friend says there is a lady with no head just over there!" She appeared torn: she clearly did not wish to appear rude, but wanted to see the headless woman. "Go!" I said. "Go and see the lady with no head!" The lady was in fact intact, wearing an oversized dress up over her head, advertising a restaurant or a concert or something. After a minute the kids came back. "She didn't really have no head," said the girl. "That's probably just as well," I said. The girl's mother came over, full of smiles, expressing hopes that her daughter and her daughter's friend weren't interrupting me. I told her what a wonderful daughter she had. Instructors could choose to take a workshop with one instructor, assuming it didn't clash with their own. 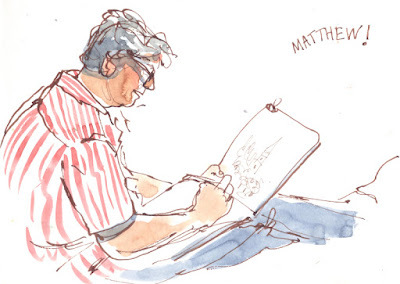 And so on Thursday morning I attended James Richards' workshop: Drawing As Discovery. You can see how tentative my drawing was, and I used a fine-nibbed fountain pen to tease out my lines. 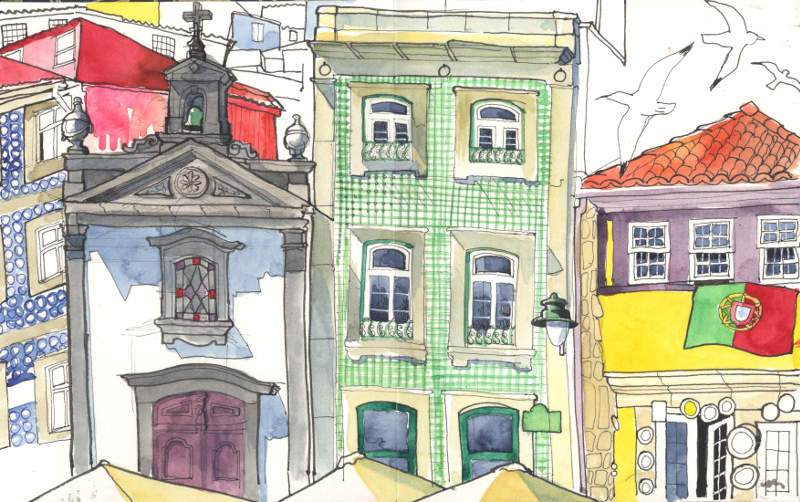 Jim asked us to look around and pick out subjects that we felt spoke of Porto, and so I chose a few things that were distinctive. I like this approach, and it's something I will turn to again in my own work. Above all, though, I was impressed with Jim's teaching style, which was fluent, gentle and inspirational. followed by two workshops on Friday and one on Saturday morning. The sketch at the start of the article was from my demo: I wanted to donate it to the silent auction, but it was far from finished. 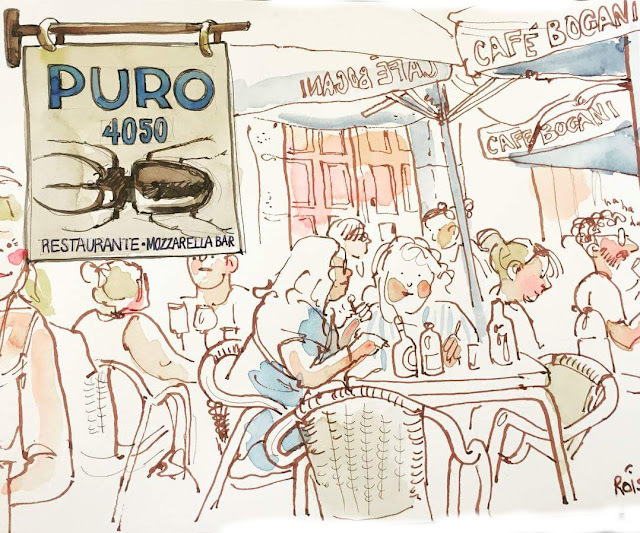 Instead I sat with a charming girl from Lisoboa, Carla, and wolfed down a lunch of cod as I sketched the café scene and then raced to the Alfándega to get it there for 2.30, when donations would close. It was only a small contribution, but it meant everything to me to do it. After lunch was the last mega sketch crawl. I can't say exactly where it took place, only that there were lots of beautiful and venerable buildings rising all around me. Once again I found myself swimming against the tide and I sketched Matthew Brehm, whose company I found most pleasant. We discussed cities that we thought might host the next symposium: not for a second did I guess that Matthew knew it was to be Amsterdam. He should be a spy or something. Back to the Alfándega for the closing ceremony, the revealing of Amsterdam, port-and-tonic, a raffle (wish I'd bought a ticket), smiles, hugs, photos and selfies, more port-and-tonic (with progressively more tonic and ice and less port) and a very tired meal much later on: and so the Symposium drew to a close. The next day, Sunday, I was on my own. I decided to do as many sketches in my home-made accordion sketchbook as I could fit into the day as a gift for my sister, who lives in Jamaica. It would be her birthday a few days later, and so I spent the entire day with my mind full of thoughts of her. It was a perfect way to spend what could have been a depressed, lonely sort of day: there's an essay I read as a schoolgirl, about how writing a letter makes you conjure up the presence of the person you're writing to. It turns out it's the same when you're sketching for someone. Every stroke you do is done with their presence hovering around your head. My sister has just come through a serious illness, and it gave me joy to do this for her, when I live so far away, and I knew that I would film it on WhatsApp for her on the day. This I did, and I believe it made her happy. 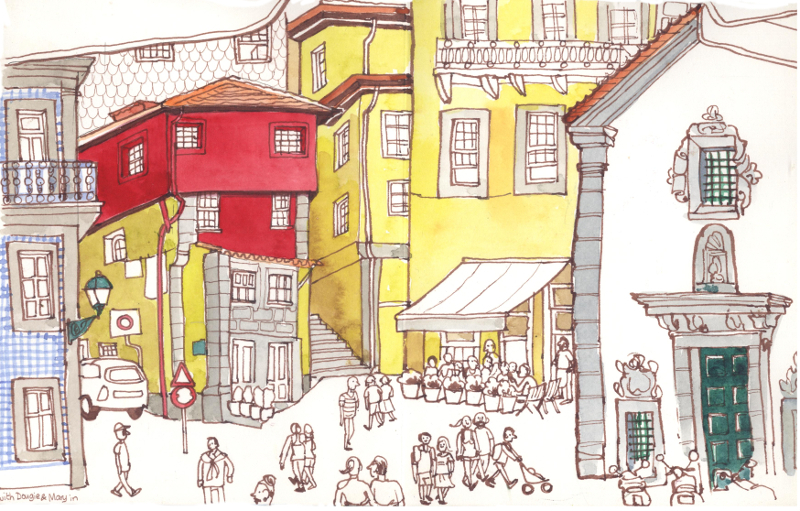 This was my first sketch, a little way along the street towards the Alfándega. During the workshops I presented in Largo de Sao Domingos, the sound of a street organ player wafted over the air. It's funny - I thought it was beautiful, The Stranglers' Golden Brown bringing me back to my teens in the Eighties, theme tunes from movies making me feel wistful - but someone else said they would explode if they heard Golden Brown one more time. The street organ player had a little boy with him, who may or may not have been his son. The lad was about ten years old and was presented to evoke a simpler time, perhaps a France of the 1940s, with a little Dutch cap, woolly socks and sandals and a scruffy little jacket. He sat perched on a stool, reading an old Asterix book, a cockatoo on his shoulder. A comically-fluffy chicken stood on a barrel, pecking seed every now and then, his feathery fringe covering his eyes. The soft wooden sound of the notes, along with the organ player himself, the boy and the props, made it a very attractive scene. I met two little girls as I sketched this boat. One was eleven and one was six. The older one wasn't half bad at English and asked me many questions, mostly in Portuguese, until, exasperated, she would try English when she was clearly getting nowhere. 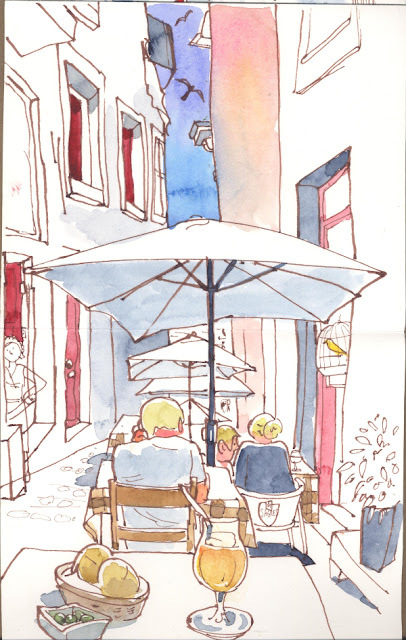 They waited patiently while I chatted on the phone (for ages) as I sketched, and didn't hit me with their questions until after I was finished. The older girl kept saying, "My cousin has asked you a question," and I kept explaining that I didn't understand Portuguese. They just kept repeating themselves, not even bothering with the "louder and more slowly" classic technique of your Englishman abroad. It was so funny to keep saying "I don't understand Portuguese!" to them without a shred of embarrassment. In the end, through their valiant efforts, we conveyed to each other our favourite colours in my paint box, that I teach children their ages and that I really can't concentrate to draw when I am trying to answer questions in a language I barely understand. It was getting late and I was hungry. I really wanted a plate of those tiny sardines - petangas - and I found them, but the restaurant was in an alleyway that was so narrow and steep my back was hurting with the effort to keep from falling forward. But those little sardines were hot and crispy and worth the temporarily sore back. The alleyway was so narrow that I could nearly have reached out and touched the other side: beside me, against the far wall, a trio of people who had seen better times smoked weed and drank. At first, as the smell of the herb wafted over to me I wished they would leave, then I reminded myself to live and let live and I forgot about them. I tucked into the sardines whose delicious aroma even now comes to mind...when I lived in Oviedo, in Asturias, the lady of the house I stayed in often cooked sardines but they were nothing like these. There was just time for a quick sketch the next morning and I knew what I wanted to do. The Sandeman sign had formed part of my proposal many months before, and to sketch it in real life held a magical significance - it meant I was there.